Join Missouri DeMolay as we host the second annual DeMolay 5K in Forest Park on Saturday, June 8, 2019. Proceeds from the event will benefit the Walker Scottish Rite Clinic at Maryville University to assist preschool age children with speech and language disorders. The 5K will start at 9:00am and all participants must register by clicking here. Registration is only $15 for ages 13-22 year (NEW student rate), $25 for ages 23 & over. Kids 12 & Under are FREE! Be sure to invite your friends to this outstanding event as we come together to help children communicate better. For questions about the event, please email us at 5k@modemolay.org. 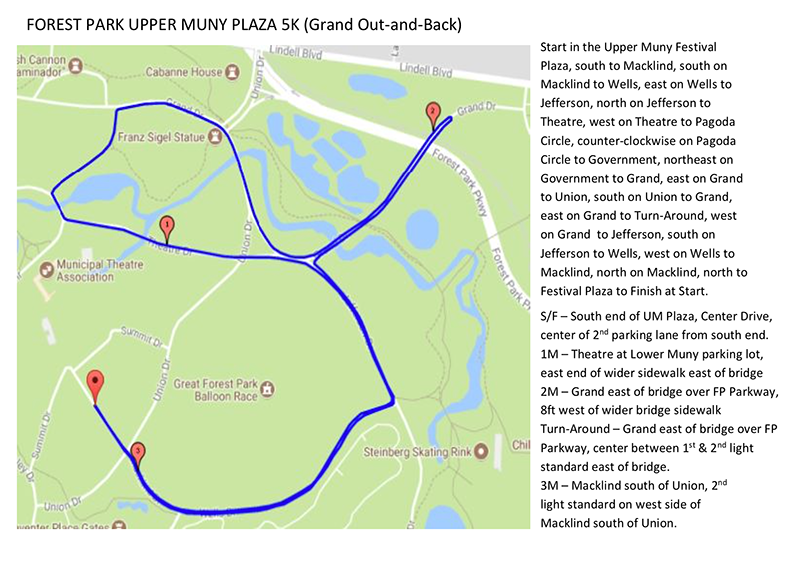 DESCRIPTION: The 5K course is an out and back starting from the Upper Muny Lot in Forest Park with markers at one, two, and three miles. ENTRY FEE: $25 per participant ages 23 & Over, $15 for ages 13-22, Children 12 and under are free when accompanied by an adult (maximum 2 free children per adult participant). Entry fee includes t-shirt, backpacks, chip timing, snacks, and beverages. Entry fees are non-refundable. PACKET PICK UP: Friday, June 7th, 10:00am to 5:00pm at the LIGHT Foundation, 10803 Olive Blvd., Ste. 100, St. Louis, MO 63141. Saturday, after 8:00am at Race. AWARDS: Top Male & Top Female Runners are awarded in each age category: 12 & Under, 13-16, 17-29, 30-45, 46 & Over. Awards for 1st place in same age category for Walkers. Medals for all children under 12. The Runner Awards Ceremony will be 10am; Walker Awards at 10:30am. PROCEEDS: Proceeds from this event will benefit St. Louis area youth through Missouri DeMolay and the Walker Scottish Rite Clinic at Maryville University for preschool age children with speech and language disorders. REGISTER: Please register online prior to the race. Walk-ins will register beginning at 8:00am the day of the race; no guarantee of t-shirt size for walk-ins. VOLUNTEER: Do you want to join the fun but don’t want to run? On course volunteers must be 18 or older. All volunteers receive a DeMolay 5K T-shirt. Please email 5K@modemolay.org for more information or call 314.852.0575. Proceeds from this event will be shared with the Walker Scottish Rite Clinic at Maryville University.